Chile means adventure. Safe enough for you to be spontaneous, exotic enough to excite – Chile is the perfect place to earn some cash, live reasonably well and, once acclimatized, travel further into the wilder parts of South America. Persuaded by a friend, who was travelling with me, I borrowed $1000 and booked a flight, one way. Neither of us had planned for the trip, but we had studied on the same TEFL course and acquired some basic Spanish after living in Barcelona for a couple of months. We wanted to experience somewhere that wasn’t so international though, where being an English teacher was a novelty not the norm. Boasting a stable, prosperous economy Chile can help you maintain a European standard of living, but offers you so much more. Having never been to America before I was surprised at the gargantuan size of the natural features. Rock formations, and mountains are scattered across the landscape, like furniture left behind by the last tenants, the dinosaurs – who you feel have only been recently evicted. Rivers, waterfalls and moonscape desert were all accessible to us. Within a month I had given up on being vegetarian, as I couldn’t turn down any more meals from Chilean grandmothers. I felt completely welcome and was experiencing new things daily. Of course this wore off. New friends and girlfriends eventually realized the distance of Chile from home, and the hugely prohibitive cost of flights, meant that I would not be staying there forever. The many inconveniences became exasperating, friends left, I missed my family and in the end I eventually returned to Europe. However every time I meet up with my friend, we remember our days in Chile as some of the fullest of our lives. Chile has a stable economy, unlike Argentina, Peru, Bolivia or Venezuela, meaning it’s unlikely for the currency to collapse and your hard earn cash disappear under rising inflation. In fact the economy is significantly better than that of countries such as Greece, Portugal or Spain, you are travelling to somewhere secure where you will always be paid on time. Unfortunately you won’t be paid very much. My school paid me $10 an hour and covered the cost of my outward metro journeys only. Most of the schools in Santiago are business focused and cater towards executives needing American English for their jobs. There is quite a big difference between what the general population can pay for English classes and what business people are willing to pay. This means lots of travelling to different multinational corporations early in the morning, at lunchtime and in the evening. If you work for an academy you invariably end up working split shifts. Whilst your base hours are unlikely to make you rich, you have to bear in mind that the cost of living can be lowered if you shop at markets and places outside of the business areas. You can also supplement your income at most academies, by doing level testing, exam marking and material creation. I made some extra money at my academy by proof reading reports. Also due to the general profile of most students you are offered a gateway to Chile’s upper class. This can be highly profitable for teaching privately. Students often asked me to teach their children and would pay $30 an hour, which can rise further still, if you know a very senior manager. Word of mouth is very important, due to the high turnover of teachers, most are willing to ‘give up their privates’ before leaving and will happily pass them onto new teachers. By the end of my time there I had a substantial income, though I was tired due to the variety of locations in my timetable. Also some schools will refund, at least part of your flight costs. As these are substantial this is definitely a bonus. Chile is probably not the best country for newly qualified teachers. Some schools ask for a year’s teaching experience, as well as a TEFL certificate that comes with substantial training, i.e. not a weekend course. I had done a good course in Barcelona and had a few months experience, though in hindsight I would have liked more as my students could be quite demanding. Students do want native teachers but only on the qualification that they are good teachers. In terms of wanting to interact socially and culturally with someone, there is a preference for American and Canadian teachers for business people as this is the typical profile of their bosses and colleagues. I would heartily recommend looking for a job before you go. We had initially planned to go to the desert town of Copiapó, a desert city 800 km north of Santiago. The intention was that in the middle of the desert we could knuckle down and perfect our Spanish. However when I told my interviewer that I look forward to meeting her she said that she would have left by the time I got there as she was moving to Santiago…as Copiapó was incredibly boring. Do your research, decide on a work life balance before you go – if you want to go for somewhere busy or quieter. 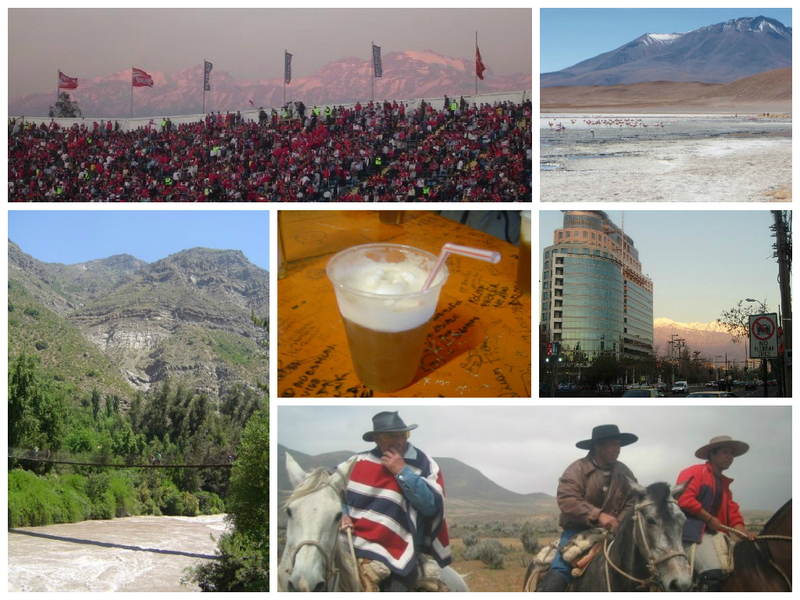 Allchile.net – is an expat forum that has a lot of good advice. Santiago is the obvious choice, not only will you have more opportunities there than anywhere else but it’s also well connected. You can drive across the Andes border to Argentina in five hours or to the costal towns of Valparíso or Viña del Mar in two. It really is the epicenter of everything cultural, commercial and social, similar to the relationship of London with the UK or Paris with France. All of Chile’s principal galleries and museums are based here, as well as a lively expat scene and concerts by national and international artists. I saw Animal Collective play in an large warehouse, which was excellent. It’s also easy to get around due to an efficient metro system. You can decide to live in Valparíso / Viña del Mar, two cities next to each other on the Pacific coast, a short drive (particularly by Chilean standards) from Santiago. However it is more difficult to find work here, as Viña del Mar mainly functions as a resort town for people vacationing from Santiago and whilst Valparíso looks picturesque, it is really quite poor. It is worth mentioning this if you intend to visit as a tourist it is quite easy to stumble into dangerous areas and myself and several friends, Chileans and English were mugged there. As mentioned there is also work in the Northern mining cities. Copiapó has already been mentioned, but more pleasant to live in are the ports of Antofagasta and Iquique around 1,100 and 1,700km north of Santiago. In both of these places it’s harder to find academies and TEFL jobs. Most of the jobs are through international schools. Concepción, student city and home of rock. Finally to the south is Chile’s second city Concepción. Home to four universities it is probably the best option after Santiago. Whilst it doesn’t have as much going on as Santiago it’s worth noting that most of Chile’s finest rock and pop music hails from here, due to the large student population. Chile is not very cheap, particularly when compared to other countries. I used to have an empanada, pastry and some fruit for lunch when I was in Santiago’s business district and it cost about $4. However going to the cheaper neighborhoods you could get a meal in an inexpensive restaurant for the same price. Supermarkets can be expensive particularly in richer areas, but local markets offer good value for money and everything is usually priced per kilo, which prevents the feeling that you’re getting ripped off. What is cheap is partying. Most clubs charge a very small cover to get in and a drink is always included in this (often the local alcohol pisco mixed with coke, a piscola, which doesn’t taste as bad as it sounds). It also usually comes in a pint glass and is generously proportioned. Oh and did I mention Britpop is loved and still played in a lot of places and most Chileans really like meeting British people. Some schools help you find accommodation, but that is not always the case. However there are many options in Santiago and you can be looking on paying somewhere between $200 and $400 a month to rent a one room apartment, but this can vary wildly depending on the area. Renting a room in an apartment would be approximately half that. The red line of Santiago’s metro acts like a graph on how much you can expect to pay, Bellas Artes is a good mid-range area and everything after Los Hereos is very cheap. If you carry on up the red line towards Providencia, Las Condes and finally Escuela Military it is significantly more expensive. This depends if you travel with a working visa or get your tourist visa upgraded once you’re there. The latter can be time consuming and involves considerable time spent in Spanish style bureaucracy, visiting notaries as well as municipal buildings. Once this is done however and you are given a Chilean residence card, you can apply for a proper bank account with a debit card etc. In the meantime you may have to resort to cashing cheques, which involves a long line on paydays. The following is a by no means exhaustive list of English language schools in Chile, divided by city. Working in Chile is not for the faint hearted, but it’s rewarding. I made some great friends there and experienced some amazing food, scenery and culture. If you want an adventure and a real achievement I highly recommend it. If you have any questions for David or also have experience teaching English in Chile and would like to add some additional advice for prospective teachers please leave your reply in the comments section at the bottom of the page. I’m a canadian with teaching experience in Malta, Costa Rica, Uruguay and Taiwan. Do you have any recommendations for schools in Valparaiso…I understand that the Chilean Naval Academy hires teachers…do you know anything about the application process? Also, I’m just wondering how many hours a teacher can expect to work per week. I’m looking at possibilities in the New year. I’ve been teaching ESL in Canada for many years and I, too, am interested in teaching at the Naval Academy in Chile. If you have contact info. I’d appreciate it as I’ve been finding it a challenge to connect with them. I have a question about teaching in Valparaiso/ Vina del Mar. I just arrived, and am interested in teaching English. For the past three years have been teaching in Tokyo. If possible, I would prefer to teach private lessons over lessons through a company. Do you have any suggestions for how to get started teaching privately?